14 x 21 in - 35 x 53 cm Watercolor This can be described as being some what in a,'John Yardley' style. This is the ref I took last May while spending a week painting with John Yardley. I selected this style for a couple of reasons. 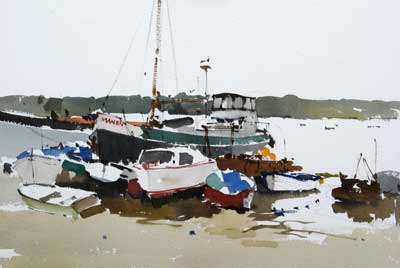 Firstly; I will be back painting with John again this year and I think the best way to benefit from sessions with him is to try to see the world as his painter's eye sees it. Secondly; I think that John Yardley's approach suits this scene well. I am pleased with how this has come out. I think this is the my first truly presentable "half sheet" I normally only paint on "quarter sheets". 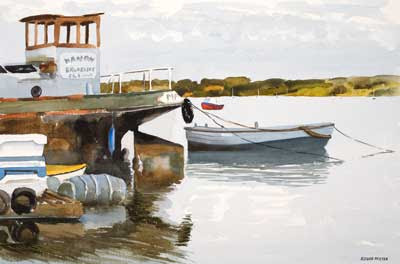 As a lot of people who come to this blog do so because they google for "John Yardley" here is the painting that John did of the same scene but from a different angle. The group of us stood and watched John paint this.